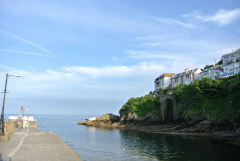 With its plum location at the gateway to the North Cornish coastline, Tregonna House sets the scene for a wonderful holiday full of adventure amidst Cornwall's natural playground of beaches, surf and coastal towns. This beautiful private house offers ample living spaces, 4 boutique bedrooms, 2 contemporary bathrooms and an established garden. 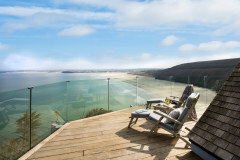 Tregonna House is located just a 5-10 minute drive from Padstow yet offers ease of access to the North of the Camel Estuary towards Rock, Polzeath and Daymer Bay. 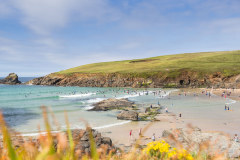 The golden sand beaches of Harlyn Bay, Constantine, Treyarnon and Trevone are easily reached and welcome the budding surfers and sports enthusiasts. Rally your family, friends, children and dogs and immerse yourself in Cornish life at Tregonna House whatever the season. 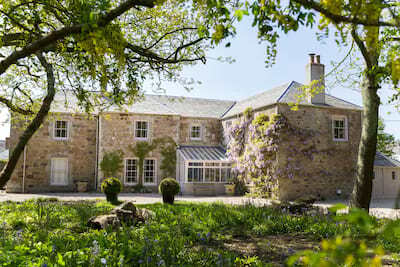 Tucked away behind the large wooden gates, Tregonna is a majestic slate hung country manor house. Arrive into the central hallway an lead through into the heart of the home, the open plan kitchen and dining area. This beautiful kitchen oozes country style with Cornish slate floor, traditional AGA and chunky wooden scrub kitchen table. Gather as a group and get culinary creative, North Cornwall is firmly on the foodie map with some first class artisan producers from fresh shellfish to Baker Toms bakery, Padstow Kitchen Garden to Padstow Brewing Company. The large dining table is perfect for lunch on the go or simple suppers. 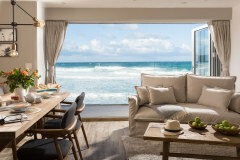 Located just off the kitchen is a large utility come boot room where all of your holiday kit can be stowed, there is also a large contemporary double shower wet room (also accessed from the driveway) perfectly placed for a post beach and surf wash down. The living room is separate and offers a quiet escape from the chatter of the kitchen, enjoy a fireside afternoon tea or relax with a favourite film. A sunny conservatory is set just off the living room and provides a further break out space for a morning coffee and daily paper catch up. Finally on the ground floor, a more formal dining room can be dressed for celebrations to remember. A central staircase leads to the first floor where a collection of 4 bedrooms and family bathroom are accessed via the central landing. Each bedroom offers a fresh neutral colour palette with cool whites setting the relaxed ambiance and have been dressed with the finest furniture and furnishings. No less considered, the contemporary bathroom ensures and indulgent pamper after a day on the coast. The established garden can be accessed via the front door or from the boot room, this wonderful country setting brims with life and colour in the summer months with aged trees providing privacy and shade. A small grassed lawn welcomes children and dogs to play safely and the large wooden gates can be closed to create a safe environment. 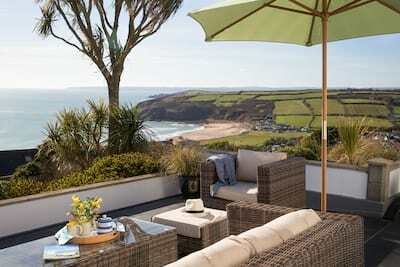 Tregonna House includes a large outside dining table and chairs where al fresco dining is encouraged. 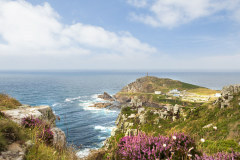 From your holiday door, the Cornish coastline is ready to be explored. Padstow is just 10 minutes drive away and is well worth a visit be it fish and chips on the quay, a slap up supper at Rick Steins or Paul Ainsworth's, a browse around the boutique shops or simply crabbing off the harbour wall as the fishing boats come and go. 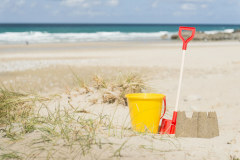 If beach days are on the agenda then you are well placed with over 7 stunning golden sand beaches including Watergate Bay, Harlyn Bay, Trevone Bay, Constantine Bay and many more. 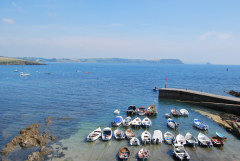 With the Camel Estuary and Atlantic surf nearby, this corner of Cornwall is popular with watersports including surfing, water skiing, windsurfing, kayaking and sailing. 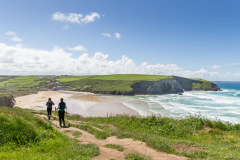 The South West Coast path provides some of the most beautiful seascapes in the county and perfect picnic spots! Little Petherick Creek offers a tranquil waterway within walking distance of Tregonna House, follow the lane along the bank of the estuary towards Padstow. The Camel Trail is a must whether young or young at heart, bikes can be hired from Wadebridge and a flat picture perfect ride leads you along the trail. 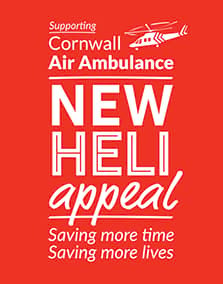 Whether lazy summer holiday or action packed weekend, Tregonna House adds a true taste of Cornish living and comes highly recommended. Up to 2 dogs are welcome to stay, house rules apply and a small pet supplement. The garden is secured with a gate to the road and has a natural boundary of hedges and trees.